Cocktail-making is as close as most people get to alchemy. One might think that cooking or baking qualify, as well. But in both cooking and baking, technique can tend to predominate, and it’s rare that you end up with something inexplicably numinous. In the cocktail, however, more often than you’d think, you can put three ugly ducks into a shaker and end up with a swan. The sum of the ingredients is greater than its parts. I don’t want to oversell this: as epiphanies go, a good drink is pretty low-rent (and comes with potential drawbacks up to and including drunkenness, alcohol addiction, and cirrhosis of the liver). But it’s a pleasant way to end the day to be able to mix a few things together and create a revelation. I don’t keep green Chartreuse in the house, so I used Liquore Strega, which is quite similar in taste to yellow Chartreuse. Chartreuse, Strega, and Galliano are all aggressive herbal decoctions that have a taste that approaches indescribable. They are spicy, woody, and hot, full of cinnamon and anise and myrtle tastes. In my house, Strega is an after-dinner drink. The food has been cleared from the table, everyone is sitting around lazily, and someone puts the bottle of Strega on the table with some shotglasses, and we sip and talk and sip and talk. If you asked me if it would make a good mixer, I would say “no”: it’s just too assertive, too unique to play nice with anything. And yet, I keep finding cocktails that Strega works well in, as with the drink I dubbed the Orange Witch, discussed in my review of Navan liqueur. When I made The Last Word I didn’t expect it to work well, but somehow it did. The Maraschino, I think, played a key role here, binding and melding the spicy strega to the citrus juice. My friend Nat had just picked up some green Chartreuse, so he let me siphon off a bit to try another experiment. First, a digression about green Chartreuse. 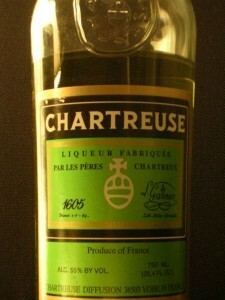 There are people who claim that, like Absinthe, Chartreuse is psychoactive in a “more than alcohol” sort of way. Green Chartreuse does share at least two similarities with Absinthe: it is green, and it has a whopping 55% alcohol by volume. It also shares a key difference with absinthe, in that the two drinks taste nothing alike: I find Absinthe to be unbearably unpleasant, whereas Chartreuse is to my taste. Your mileage, of course, may vary. Put simply, I think the claims of Chartreuse’s “thujone-like” psychotropic effects are, at best, ridiculous garbage believed only by the hypergullible. I think that one doesn’t need to posit any strange mystical herbal-induced psychosis when a far simpler explanation (“You’re drinking something stronger than the strongest vodka you’ve had!”) suffices. Using the excellent Cocktails+ for iPhone application (which, by the way, is free until April 12th), I found what seemed like an interesting recipe: the Beuser & Angus Special. Essentially, this is a Chartreuse Sour. It combines green Chartreuse, Luxardo Maraschino, lime juice, some sugar, and an egg white. It’s a fair approximation to describe this as a “Last Word” without the gin. As with The Last Word, it was surprisingly drinkable, even with what I considered to be an excessive amount of Chartreuse. The proper Last Word was a bit more balanced, I thought. Based on my experiments, I’d say Strega is a perfect substitute for Chartreuse in terms of taste; in cocktails, adjust the recipes accordingly for your preference in terms of the amount of alcohol. It’s also a bit less expensive. The only drawback is if you value the unearthly green tinge that green Chartreuse gives to your drink. If you’ve never had it, try some Chartreuse (or Strega) the next time you’re at a well-stocked bar and see if it is to your taste. Perhaps it will end up being a potion in your alchemical cupboard. Feel free to let us know how you liked them in the comments section below. Driving home from work this evening, I heard this story on NPR: ISSU Angered by Liquor Control Board. Basically, the Independent State Store Union is complaining about the PLCB’s latest ad campaign. Can someone explain to me what possible horse the ISSU has in this race? The only hypothesis I could come up with, in my cynicism, is “Hey, if this advertising campaign is effective, we might have to work more! That would be terrible. We hate doing our jobs because we are shiftless and lazy.” I’d love to hear if anyone else has another theory. I claim that fried chicken and waffles (with syrup) is inexplicably tasty. Maybe once a year I get another strange herbal alcohol/liquor. This year it is Zwack. Last year it was Bénédictine. Before that was Campari, ah, the summer of Negroni’s. Chartreuse, yellow, and green, was sometime in the late 90′s. Now, I tend to mix herbals with brandy instead of gin. Blame the B and B. Yes, you can get chicken and waffles in the real life verson of Fallout 3′s, The Pit. No, not the PA Deutsch version of chicken pot pie without the crust on top of waffles either. Simmies, on the north east edge of Homewood, toward Verona, and Penn Hills on Frankstown. Fried chicken and waffles only on Wednesdays, Saturdays, and Sundays. Lots of soul food, and seafood otherwise. PG actually did a review of it in 2005. The price has gone up for a 2pc c&w from $5 to $6. 1/2 a chicken with waffles, $8. Still a heck of a bargain.